• Instructor Level- Wu Wei Chuan Lum, (a private student of founder William ”Sarge” Edwards). 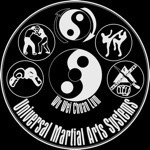 • Universal Martial Arts Studio, Integrated Martial arts curriculum. • Coached fighters for amateur and professional Martial Arts Competitions appeared on Pay per View Events. • Conditioned Law Enforcement Cadets for physical training and defensive tactics prior to entering academies. • Developed Edged and Blunt Weapons, Close Quarter Combatives, and Ground Survival Courses for military and law enforcement agencies. • Personally trained well known musicians, entertainers, and professional athletes. • Universal Marital Arts Systems – Universal Defensive Tactics – Founder, Chief Instructor. • D.C.S.O. Nashville TN. – Instruct Subject control, Firearms, Baton, Chemical Weapons. What are your hours and days open? What age group do you teach? Do you teach coed? Will notify here if we get up and running again.